Bubble in IPOs – Is there an upside to CarGurus? 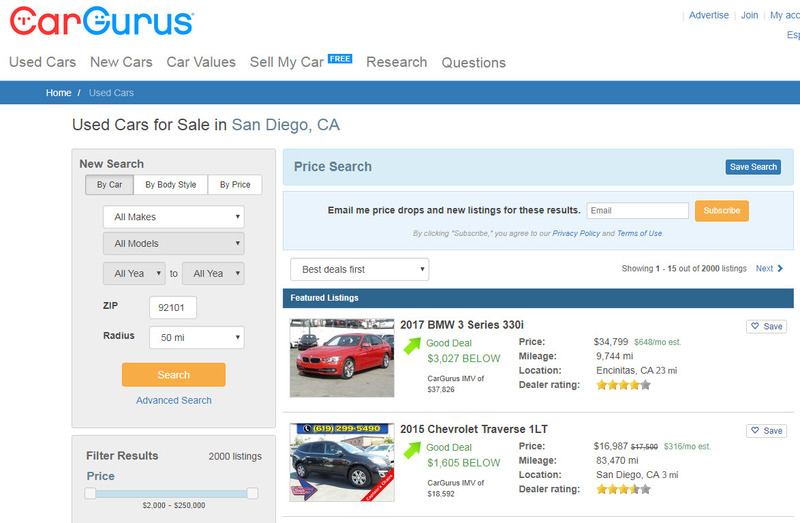 CarGurus operates a popular online platform to connect sellers and buyers of new and used cars. Its revenues grew by 100% in 2016 and 70% in the first half of 2017. Growth was supported by aggressive marketing spending that dramatically reduced profitability, and this will probably continue in the future. The Company has no significant competitive advantage, so growth will moderate in the future. The share is probably overvalued. Stay away. 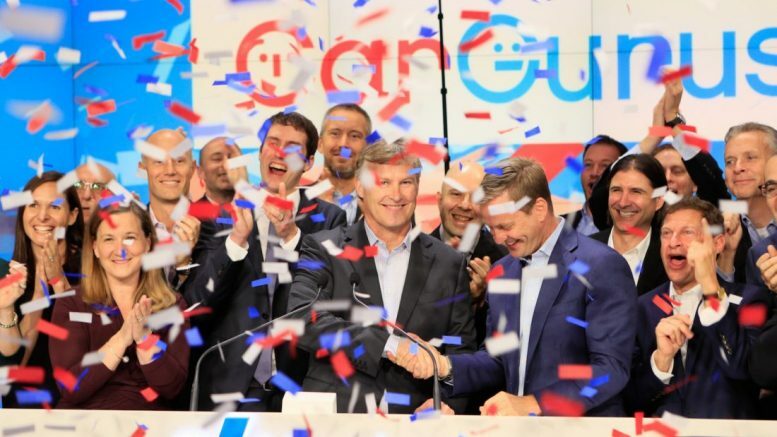 CarGurus IPO last week was very successive for the underwriters as the stock jumped on day1 from $16 all the way to $29 (a market cap of nearly $3 billion). Now it is already traded at $33. This behavior is very similar to what happened recently at SnapChat (SNAP), Roku IPOs. Both of them surged sharply immediately after the IPO, but have started to fall down later on. I predict that CARG will behave similarly in the next 12 months after the hype cools down and investors realize that the stock is extremely overvalued. CarGurus is an online marketplace connecting buyers and sellers (dealers and individuals) of new and used cars. The company makes money from subscription fees it collects from car dealerships that offer their vehicles for sale on the site, and from selling advertising space. It operates in a market saturated with competitors with strong brands such as AutoTrader, Cars.com (which I own in the LongRunPlan portfolio), Edmunds, KBB, Autobytel, Carfax, TrueCar, NadaGuides and more. CarGurus claims to have an advantage over competitors because of a smart algorithm that can weigh many parameters and predict the “fair” price of used cars. According to the company, only this algorithm determines the ranking of the vehicle dealership displayed on the site, rather than how much money it has paid for advertising (which is probably what is happening on most sites). Thus, according to them, the client can best understand whether it is a worthwhile deal or a bid at an excessive price. This feature is indeed useful, but I’m not sure that it gives the company a significant advantage over competitors, which also have mechanisms that help the customer make an informed decision. In the end, the choice of a customer on which site to use is probably determined by the reliability of the site, less in what sophisticated ranking algorithm it offers. What’s more, according to eMarketer’s latest report, the automotive advertising market stood at $9.1 billion at the end of 2016 and is expected to grow to $15.2 billion in 2020, so the business is large enough to feed a wide range of players in the industry, including CarGurus. 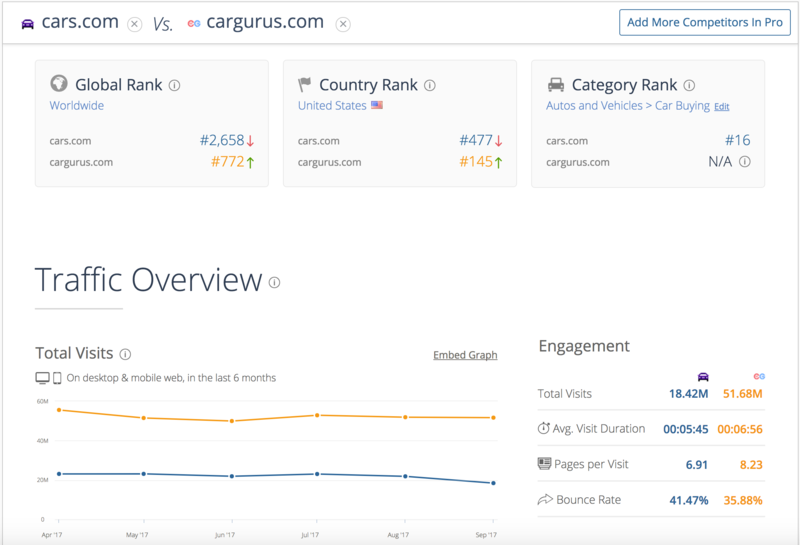 According to CarGurus’s sales and the traffic to its website, the company has managed to position itself as a leading player in the industry (similarweb.com). It also wins most competitors on the social media field (it has 520,000 followers on Facebook compared with Cars.com, for example, which has only 337.5 thousand followers). On the other hand, which is a little strange, when you search for “buy a car in the US” or “used cars” on Google, on the top of the list you get links to Cars.com and AutoTrader, and CarGurus appears much below. I do not know why Google does not like CarGurus, but it teaches that other brands have better visibility in search engines. 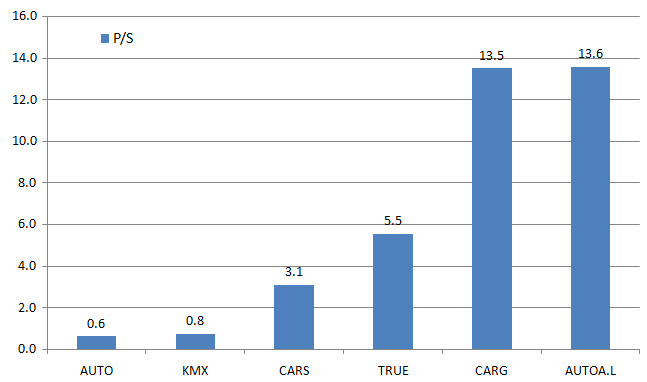 The popularity of CarGurus (according to the traffic data) is also reflected in the company’s significantly higher growth rate than its competitors. CARG’s sales grew by 100% in 2016 and 70% in the first half of 2017 compared to the first half of 2016. For comparison, Cars.com grew by 6.1% and AutoTrader by 10% in 2016. 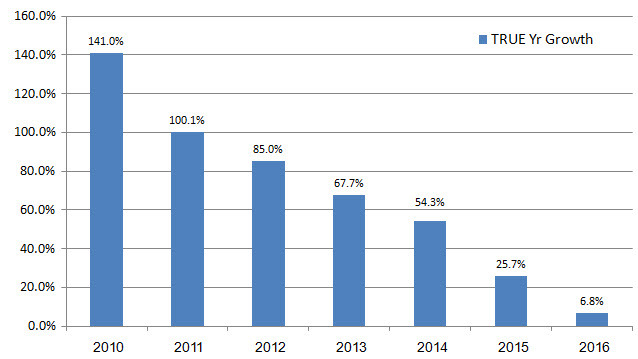 The big question is whether CARG sales can continue growing at such a high rate over a longer period of time. In principle it is possible. Companies such as Google, Amazon, Facebook, and others have been able to grow at a high rate over many years. But we must admit that CARG is not Amazon. One can argue whether its service is better or not than its competitors, but it certainly is not unique in a way that will lead it to take over most customers in the industry as Amazon does in many areas. As a matter of fact, if Amazon decides to enter the automotive industry, and that is not inevitable (eBAY, for example, has already entered a limited activity in the field), the sales of CARG will be in jeopardy. Therefore, I doubt that high growth will last for too long. And anyway, as we will see below, to support CarGurus rapid growth you will need to continue to spend a lot of money on marketing and this limits the profits. 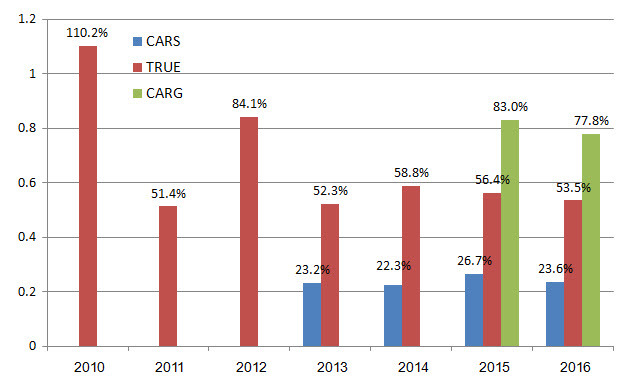 A good example of what might happen to CARG’s growth is TrueCar (TRUE), whose growth moderated from 141% in 2010 to 6.8% in 2016. The difference is that in 2010 TRUE had sales of only $38.1 million, which made it easier to grow at such a high rate. CARG’s revenues are expected to be $250 million in 2017, among the highest in the industry, so it will be difficult to sustain such growth over time. The company itself also admits in its pro forma report that it will not be able to continue to grow at a rate similar to that in the past, mainly due to strong competition in the sector. It is important to emphasize that the CARG platform is offered not only in English to American customers, but also in French, German and Spanish. This is part of the company’s strategic decision to operate its platform in markets outside the US. If this succeeds, it can boost sales, but the problem is that those previous companies that tried this move failed. The main reason is that it is difficult to brand new service outside your home country, especially when there is strong competition against familiar local platforms. In any case, to grow outside the US, the company will have to increase its marketing spending even more, and it will continue to weigh on its operating profitability in the foreseeable future. This is not good news for Wall Street analysts who will soon begin looking at the company’s earnings per share, and might not love what they see. How aggressive are the company’s marketing expenses? Contrary to TRUE, CARG produces a positive net profit from its operations, which is an important plus. Still, its profitability is dramatically lower than competitors’ profitability. The main reason for the low profitability is the company’s huge marketing expenses, which stood at 77.8% of sales in 2016 (!). When you want to grow aggressively, especially when there is strong competition in your field, you must invest a lot of money in marketing. The point is that in order to maintain the company’s rapid growth rate, it will have to continue to spend such high marketing expenses. 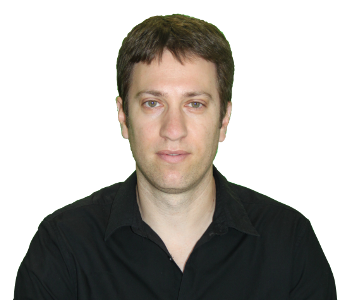 TRUE also had such huge marketing expenses in the early years when it grew at rates as high as those of CARG, and it was forced to continue market its services to reach its current size. In fact, even in 2016, its marketing spending was 53.5% of sales, but its growth was only 6.8%, similar to the growth of Cars.com, which spent only 23.6% of sales because of the stronger branding it has. This is a risk for CarGurus because it means that if CARS feels threatened, it will be able to increase the marketing expenses as much as it wants to “steal” customers from CarGurus. In fact, the first signs of a slowdown in growth can be already seen in CarGurus’ latest report. 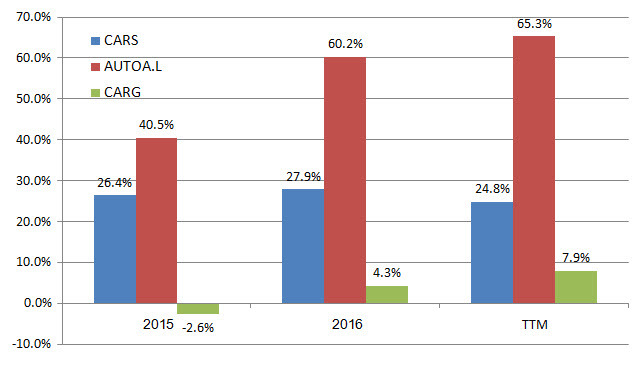 In the first half of 2017, marketing expenses declined to 73% (compared with 81% in the first half of 2016), and accordingly, growth slowed to 70% (100% in 2016). Now that it is a public company that investors and analysts will examine its EPS, we can guess that it will have to reduce its marketing expenses in order to maintain a high share price, and accordingly, the rate of growth will decline, as I said before. So how much does CARG really worth? The latest pro-forma report of CARG shows that the company has about 105 million shares outstanding, of which it sold 9.4 million to the public. However, it is important to note that 6.9 million of these shares held by investors from the time that the company was private, so that most money received in the IPO went to them and not to the company. In other words, the IPO actually raised only $40 million (2.5 million shares issued at $16 a share). At the end of the second quarter, it had $81.3 million in cash, and together with the IPO money, it now has around $121 million in cash. CARG has no debts at all, so its balance sheet is very strong. This is good but not surprising as it is actually an internet company. Without going into complex valuations, I think you can get an idea of a reasonable valuation of CARG by comparing its EV/EBITDA to the multiples of the competitors. Even a quick look at the company’s multiples against its competitors shows that it is traded at a price that is too expensive. CARG trades at an EV/EBITDA of 150 (!). For comparison, Amazon trades at the EV/EBITDA of 36 and Facebook on 25.8, much lower than CARG, and I said earlier that CARG is neither Amazon nor Facebook, and both are expected to continue to grow at very high rates in the coming years. So, assuming I’m not missing something basic here, it seems like a too expensive valuation. So why are investors so excited about the share? Those who buy CARG at the current price ($33) probably justify the expensive pricing by assuming that rapid growth will continue and profitability will rise to the industry average. But we’ve already seen evidence from TRUE that it’s often impossible to sustain high growth without continued aggressive marketing (unless you’re Apple…). But let’s assume a different strategy – CARG will give up rapid growth and in return, they will have to spend much less for marketing. If they decrease their marketing expenses to a similar level like Cars.com (about 24% of sales), they will generate another 50 cents of operating profit per dollar of sales. This will reduce its EV/EBITDA multiplier to 22.2, still very high, even higher than that of AutoTrader (18.6). 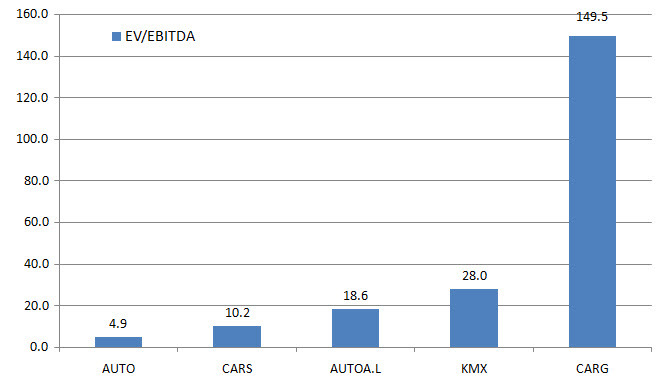 In comparison, Cars.com trades at an EV/EBITDA of 10.2 and AUTO at only 4.9. It is important to remember that reducing marketing expenses will come at the expense of growth, thus, in this case, Cars.com is also more attractive than CARG (and that’s why I own CARS and not CARG). In addition, AutoTrader and Cars.com are already familiar brands that appear first when you Google for cars to buy, so that in order to grow like them, CARG will still need higher marketing expenses than they do. But it’s an imaginary scenario because CARG probably is not going to cut marketing costs dramatically in the near future, so those buying its stock should get used to low profitability in the foreseeable future. If you want to look at additional multiples, it is better to look at the Price to sales multiple (P/E ratio is not representative here because the company is in its high growth stage and the marketing expense percentage is higher than the normalized level). Interestingly, you see that CARG trades at a sales multiple similar to AutoTrader. Here, too, we see the expensive valuation of CARG (by the way, AutoTrader is also traded at a relatively expensive price, but it is growing by 10% a year and producing exceptional operating profit margins). There is no doubt that CarGurus is a quality company with a strong balance sheet, which operates a popular platform that attracts a lot of customers that generate impressive revenue growth in recent years. Therefore, it is likely that the hype surrounding it will continue in the near future. However, in my opinion, the share is worth no more than $20, so at current price, there is no upside left. Still, I would not recommend selling it short, because I do not see a trigger that will dramatically reduce the price in the immediate future (but patient investors can consider buying long-duration put options at small amount). The only hope for those who bought the share can only happen if one of the leading players in the industry decides to buy CARG and will have to offer a purchase offer at a premium on the market price. Otherwise, I estimate that, as happened after previous hyped IPOS, here too we will see the share gradually decline in the coming year. The stock will be interesting to be re-examined only if it falls back below the issue price ($16). 2 Comments on "Bubble in IPOs – Is there an upside to CarGurus?" Yinon, just curious this seems to be a move away from your typical spin off transaction. What was your purpose in doing so? Good question. I never look at IPOs at the beginning of their life as they tend to trade lower after 12 months. In this case, however, I was familiar with CarGurus since it’s one of Cars.com competitors, so I checked it and share my thoughts with all of you. Also, I wanted to warn investors from buying this hype (overvalued) stock… Enjoy.